This is the story for my summer camp. Shihan Wildeboer from Holland will organize an international summercamp on the 11th of July till the 13th of July 2014. There will be many international instructors on this camp under guidance of Shihan Wildeboer, but the most special instructor will be Monma Shihan from Japan, from the World Sokyokushin Organisation. Shihan Wildeboer is very proud to have Monma Shihan as an instructor in his summer camp. Everyone is welcome to participate, from all over the world regardless style or organization. 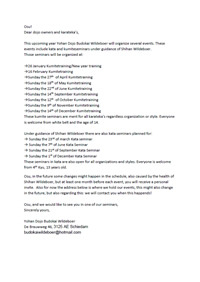 Please sent an email to kyokushinwildeboer@gmail.com for more information about this summer camp.